Malicious mobile code is a new term to describe all sorts of destructive programs: viruses, worms, Trojans, and rogue Internet content. Until fairly recently, experts worried mostly about computer viruses that spread only through executable files, not data files, and certainly not through email exchange. The Melissa virus and the Love Bug proved the experts wrong, attacking Windows computers when recipients did nothing more than open an email. Today, writing programs is easier than ever, and so is writing malicious code. The idea that someone could write malicious code and spread it to 60 million computers in a matter of hours is no longer a fantasy. 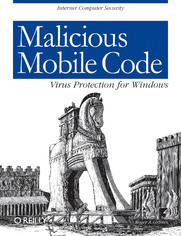 The good news is that there are effective ways to thwart Windows malicious code attacks, and author Roger Grimes maps them out inMalicious Mobile Code: Virus Protection for Windows. His opening chapter on the history of malicious code and the multi-million dollar anti-virus industry sets the stage for a comprehensive rundown on today's viruses and the nuts and bolts of protecting a system from them. He ranges through the best ways to configure Windows for maximum protection, what a DOS virus can and can't do, what today's biggest threats are, and other important and frequently surprising information. For example, how many people know that joining a chat discussion can turn one's entire computer system into an open book? These days, when it comes to protecting both home computers and company networks against malicious code, the stakes are higher than ever.Malicious Mobile Code is the essential guide for securing a system from catastrophic loss. Why Another Book on Viruses? What Is Malicious Mobile Code? How Bad Is the Problem of Malicious Code? Malicious Mobile Code for the Social Good? How Does Malicious Code Spread? What Are Trojan Horses and Worms? Why Is Outlook Such a Popular Target? Why Do People Write Hoax Messages? Where Should Antivirus Software Run? Should you disable the antivirus scanner to install new software?